Creating a Care Plan that is focused on your choices and your dignity. We are proud of our compassionate home care program designed to help people stay at home and healthier longer. IT ALL BEGAN WITH ONE PERSON who dedicated herself to make a difference within the community in which she lived. This person was a Phd. student at the Royal College of Art and as an artist she devoted herself to use the classical principles of craftsmanship, where the craftsman created unique objects for the user, so the user could become bonded with the creation. As every craftsman asks the questions from time to time, so did she: from which materials, what artifacts, and for whom to create? Her idea was to encase old and used textiles in hand-sized polymer tiles which was extracted from waste products. She proposed that material and meaning were closely connected. And so her assumption was that “the look, feel, touch and smell of the materials alert all the senses”. Therefore she chose as the user group the residents of Alexandra Care Home, who were diagnosed with Alzheimer’s disease. The importance of her unique crafts was not only serving the purpose of changing the “cold clinical” (CQC report) aspect of the care home into a homely environment, but to engage the residents in the process of change throughout a series of workshops where they could create their own polymer tiles in which they could preserve their personal memories. Besides the fragments of memories which come back to life in the form of polymer tiles her main focus was the recreation of a homely environment, within which the elderly is listened, is heard, participating, interacts, and sees the objects which triggers emotions from the past. Violet Care Agency Ltd. gave full credit for Julie Behseta’s ideas, therefore it fully aligns itself to her believes that homely environments are essential for the elderly, and it will continue promoting the concept of deep tacit knowledge through a series of workshops where all carers and elders will be welcomed, to begin their own journey of reminiscences. We believe that our unique method can make the life of the elderly more colorful and engaging, therefore the violet care method is about providing care plans tailored to the individual’s needs which are elaborated with the participation of the service user, and includes the arrangement of a series of workshops in homely environments within which the people centered, cognitive and social abilities of the elderly can be triggered. We set our core values to be guided by them. This is the ethos of our company. We believe that people who work for you should be an extension of your family and we only work with caregivers that share this philosophy. We pride ourselves on our high profile carers , who come from multicultural backgrounds are fully trained and display qualities of compassion, honesty, kindness and empathy. We specialize in providing affordable live in care accessible to everyone. 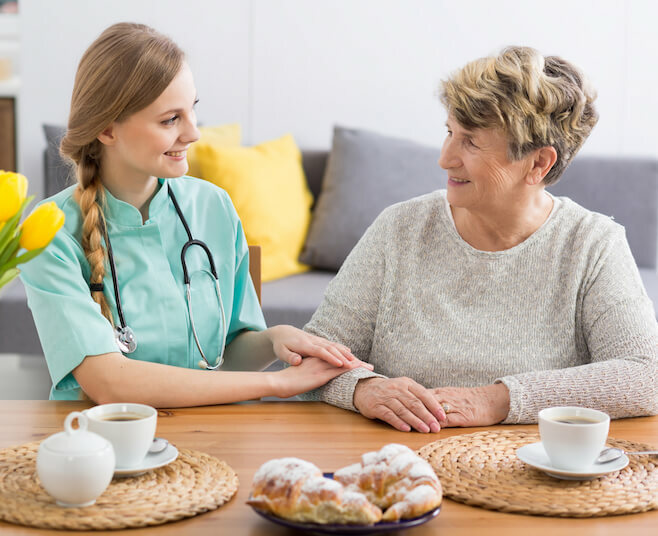 The leadership team at Violet Care discusses what home care means to them and how Violet Care is changing the way the world ages. In her role at the helm of Violet Care, she is proud to implement an innovative approach to live in care. Providing the vulnerable adults with a care service which is user centered. Roxana Cojocariu has more than 7 years experience in recruitment and care co-ordination; delivering bespoke care packages for service users. I am so happy with my carer she has been with me for 2 years and has become a part of our family. I dont know what id do without her. My dad had many carers from other Agencies but the Violet carer made him really happy. All the testimonials on Violet Care are written by clients from our community. So any testimonial you see is based on a stay that a guest had in a host’s listing. Download any of these eBooks or guides for free.